When I was a teenager we wanted to have a spooky party. Growing up in Australia, Halloween wasn’t celebrated as much as it is now and orange pumpkins were rare. To create the atmosphere I wanted I used oranges to make Jack O’Laterns and put tea light candles in them. 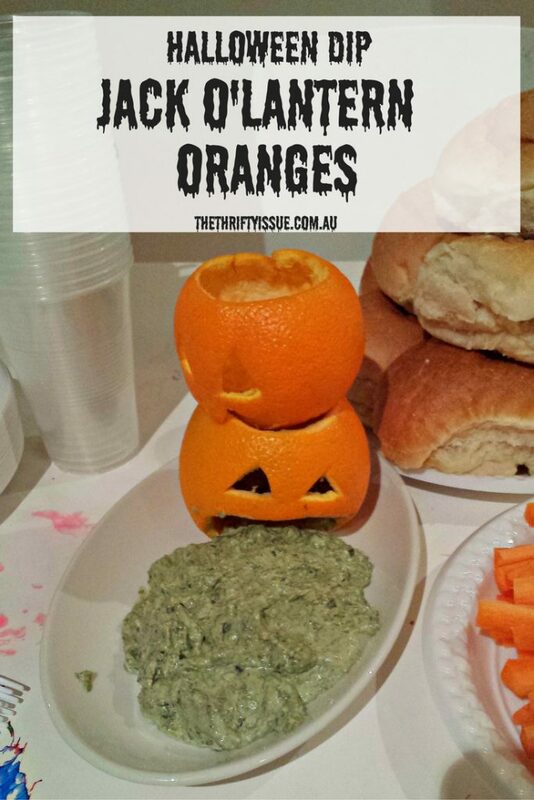 More recently, for a party we made Jack O’Lanterns from oranges for decoration and as part of the food. My daughter wanted them to be zombies, so one Jack O’Lantern is eating the others and this is their vomit. She’s delightful! 4.) Place your Jack O’Lantern orange on a plate and place the dip in front of it to look like spew as shown in the picture above. It’s a relatively easy process, you can make as many as you want and it creates a point of different for the table. Serve the dip with vegetable sticks and crackers. *Bonus frugal tip – use the orange flesh in a fruit salad or make an orange cake. Don’t just throw it out. Do you celebrate Halloween? What are your favourite traditions?